"Waiting On" Wednesday is a weekly event, hosted by Breaking the Spine that spotlights upcoming releases that we're eagerly anticipating. What They Say.... A Small Indiscretion fixes an unflinching eye on the power of desire and the danger of obsession as it unfolds the story of one woman’s reckoning with a youthful mistake. At nineteen, Annie Black trades a bleak future in her washed-out hometown for a London winter of drinking to oblivion and yearning for deliverance. Some two decades later, she is married to a good man and settled in San Francisco, with a son and two daughters and a successful career designing artistic interior lights. One June morning, a photograph arrives in her mailbox, igniting an old longing and setting off a chain of events that rock the foundations of her marriage and threaten to overturn her family’s hard-won happiness. The novel moves back and forth across time between San Francisco in the present and that distant winter in Europe. The two worlds converge and explode when the adult Annie returns to London seeking answers, her indiscretions come to light, and the phone rings with shocking news about her son. Now Annie must fight to save her family by piecing together the mystery of her past—the fateful collision of liberation and abandon and sexual desire that drew an invisible map of her future. What I Say....One thing I love about writing this blog is that I get the chance to try out some debut authors that I probably otherwise would never have seen. This book was one of those gems. 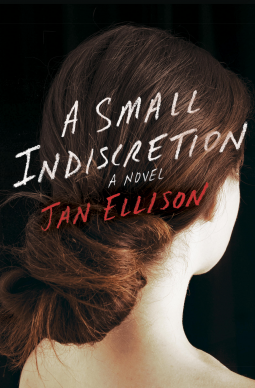 A Small Indiscretion tells the story of one woman's emotional life as a narrative to her son. For the first part of the book, Annie tells the story of her youth in England. She struggles with an absent father and an overworked mother, and for some reason, decides to move to England with very little money. She falls into a job with Malcolm, an older, wealthy man who falls in love with her. She is torn between feelings of gratitude for his care and concern and feelings of not being attracted to him. These feelings are escalated when she meets Patrick, the man who is involved with her boss's wife (they enjoy somewhat of an open marriage). Annie begins an affair with Patrick, which causes growing feelings of distaste for her boss. The only problem is that Patrick doesn't seem to have any true romantic interest in Annie, it's more of an available body situation to him. But his disinterest only fuels Annie's desire. As we follow Annie, we discover that she has been married for twenty plus years, but her marriage is currently in trouble, her son has been involved in a serious car accident and is now either missing or no longer alive, and she is writing her life story to try to make sense of her situation. I don't want to give any spoilers, but for the first 3/4 of the book, I could not put it down. I was so anxious to know what happened to ruin her marriage, where her son was, how the affair of her youth ended. But in the last quarter of the book, it kind of fell apart for me. (I can't explain why without a spoiler - so spoiler alert) The thought that Annie would seek Patrick out, and then come to the realization that she no longer needed love from him, but would still sleep with him was a little unbelievable. And that as soon as she returned home, she would just blurt this news out to her husband. The letter from Emme's uncle felt like a cheap fix to finish that storyline off, as did the business card in the hatbox. I also didn't like that as Annie looked at the pictures of herself with Malcolm, she suddenly saw love in her face for him, when we had previously been privy to her private feelings of feeling disgusted by him and his clingy behavior. But now she suddenly decided that based on these pictures, she must have loved him. I couldn't decide whether she was trying to convince herself of this new truth or if she really just was that delusional. But overall, this book was a page turner, and this author has so much talent, I can't wait to see what she does next. Thank you NetGalley and Random House for the chance to read and review this book!